How do you know if you should commit to your business idea? 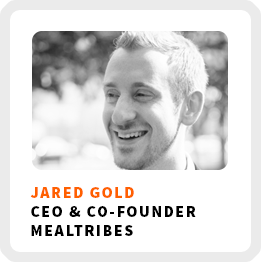 Jared Gold believes you need to find a business idea by experimenting with it. He runs Website By Tonight, a web design firm specializing in working with solo entrepreneurs and independent consultants to create simple and attractive websites in real-time using screen sharing for a low flat rate. He also runs a side hustle, MealTribes, a platform to connect people in their 20s and 30s for fun gatherings, lead by their hand-picked Tribe Leaders. How Jared defined success for himself. Why he didn’t charge his first couple of clients for his services. Develop your self-awareness to find clients in alignment with your needs and values. Actively limiting or removing distractions from your work environment. Ideal work environment: Open office or co-working space with lots of wood and exposed brick, plants around, fast paced but not frenetic, fairly quiet, few interruptions, and at a standing desk. Definition of success: Doing interesting work with people he enjoys working with, feeling like he belongs in the circles he works in, and a level of financial stability. 90-day goal: Scale up Website By Tonight by testing out some marketing, working on the MealTribes Scavenger Hunt, and pushing growth for MealTribes. 1) Understand that self-employment isn’t always the highlight reel we see on social media and that there may not be a perfect time. 2) Make sure you like what you’re doing and find a way to dip your toe in the water before fully committing. 3) Examine and be willing to accept the trade-offs that come with leaving a potentially more steady job. Mention you heard Jared on this podcast and get $50 off a package from Website By Tonight.